Greetings Loyal Airmen, above is a pix of the Air Chief and our daughter Heather, who recently visited us here in Colorado. 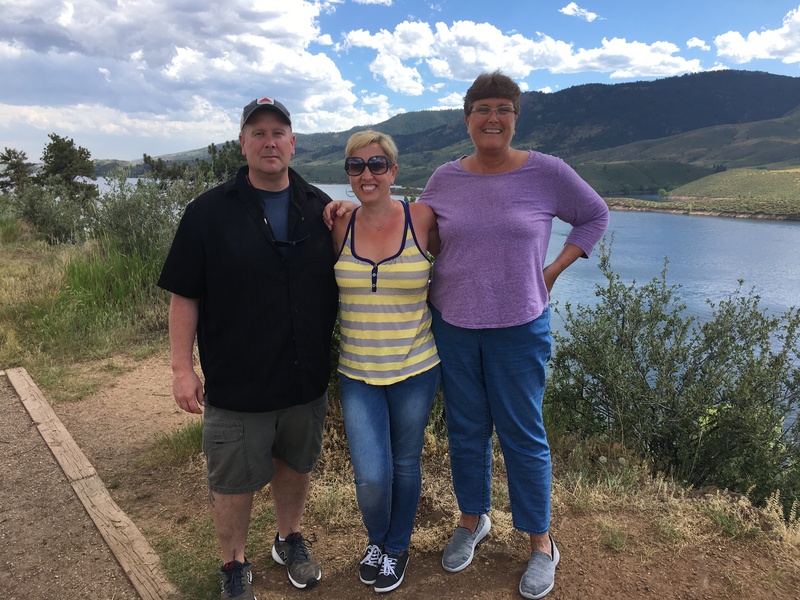 It was her very first trip to our home in Fort Collins and all of us loved having her with us. One day, we took her up to the famous Stanley Hotel in Estes Park. 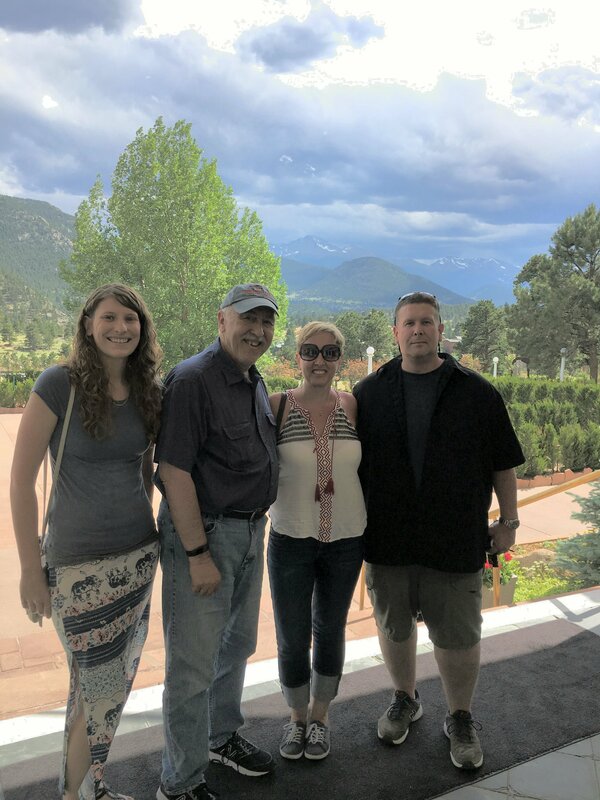 If the name sounds familiar, that’s the hotel which served as inspiration for Stephen King’s horror novel, “The Shining.” In the photo on the left, four of us are standing on the front porch of the hotel, the Rocky Mountains our backdrop. Left to right is grand daughter Cora, the Air Chief, Heather and her step-brother Alan. 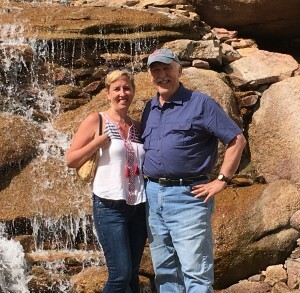 Alan was such a gracious host happily taking time out from his own busy life to make sure Heather had a great time with us. 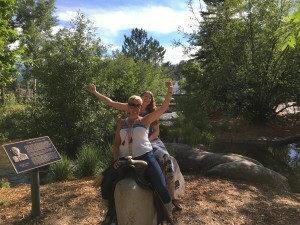 On the right, she and Cora ride a bronze saddle we found atop a rock along a creek that ran through Old Town. A kind passerby took the shot on the left with all of us still strolling through Old Town. 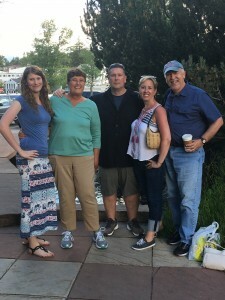 Left to right, Cora, Valerie, Alan, Heather and the Air Chief. The following day Alan took us up to the giant reservoir lake above Fort Collins and the Air Chief snapped the photo to the right. Then on Sat morning, Heather jumped in her rented Jeep and took off for Vail where she hooked up with old college friends at a wedding. The next day she flew back to her home in Chicago. Again, her stay was so great and we will miss her all ready. We have such a great family. 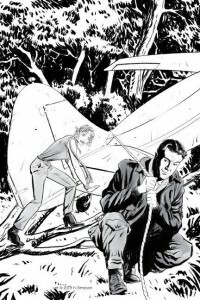 This week Airship 27 Productions released it’s latest pulp novel, “The Adventures of Captain Graves” by writer Thomas McNulty. Best know for his westerns, McNulty sets this tale in the South Seas of the Pacific and it’s glorious old fashion pulp adventure. Ted Hammond provides the stunning cover and the interior illustrations were done by Ed Catto. As ever, we hope you Loyal Airmen will give it a try. Available in paperback and on Kindle from Amazon. As ever, thanks for your support. 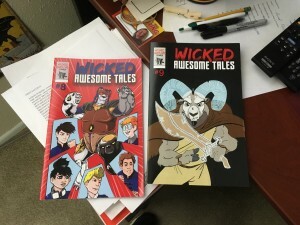 On the comic book front, pal Todd Jones just released issues # 8 and # 9 of his fun, black and white anthology series, Wicked Awesome Tales. As ever, all of us like to share our strips and fans of the Air Chief will find the same strips in Warren Montgomery’s Fun Adventure Comics. Anyways, issue # 8 of WAT features one story by the Air Chief and another by Eisner Award winner Mike Baron, who just happens to be another Fort Collins resident. Issue # 9 actually features two stories we wrote, one with artist Olivia DeGaine and nails the cover spot with our Raizee the Ram. This particular story will be part of Raizee’s own comic, THE WOODEN BLADE, coming soon from Olivia’s own label, Pulp Fission. Will keep you posted. Finally we thought we’d leave you with a sneak peek at some Howard Simpson artwork. Howard is now doing the illustrations for our new “Aviation Aces” anthology. Look for it to arrive either late Summer or early Fall. And there you have it Loyal Airmen, Happy 4th of July, wishing the United States of America a glorious birthday. Still the greatest country in the history of the world. May God always bless her.